With all of those spinning blades and a camera as a roving eye, it was only a matter of time before someone came up with the idea of a killer-drone horror flick. The Drone is brought to us by comedian and writer Jordan Rubin, whose other work includes a movie about zombie beavers called, what else, Zombeavers (currently with a 4.8 rating on the Internet Movie Database). The Drone‘s absurd trailer suggests that it, too, may end up with a sub-5 score on IMDb, though let’s not be too quick to judge here — after all, it may have great comedy value. 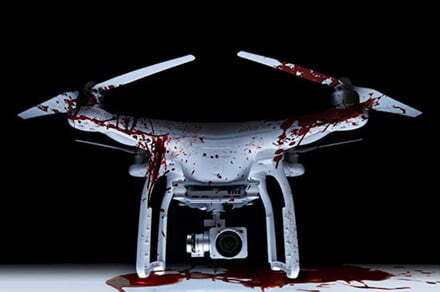 The premise is something like this: A DJI Phantom quadcopter becomes possessed by the spirit of a serial killer before it sets about terrorizing newlyweds Rachel (Alexandra Essoe) and Chris (John Brotherton). As you may have already worked out, “the couple must fight to stop the insidious device before it destroys them both,” so say the movie notes. Cut to Chris taking his Phantom quadcopter back to the store to ask why the heck it went off by itself to film Rachel sunbathing in the yard. Another clip in the trailer shows Rachel emerging from the shower, only to be startled by the drone hovering right there next to her, though it’s a little weird how she failed to hear it before noticing it. A cop investigating the bizarre events is caught quite literally with his pants down (he’s on the toilet at the time, y’see) when the drone bursts through a ventilation grill to reveal in no uncertain terms how it feels about being the subject of a police investigation. SWAT teams can’t take it down, nor can a broom-wielding Rachel, and Chris can’t do anything because he’s in a car being driven by the possessed drone. It’s a god-awful mess, and the only way to find out what happens to the pair will be to give up 82 minutes of your life to watch the movie. Or to skip to the final 15 minutes. The Drone is currently in post-production with no specific date for release, though expect to see it land in theaters or on streaming services sometime in 2019.